What type of tree do I have? Landowners and homeowners are often unsure what type of trees they have and what pest may be attacking their trees. Your best resource may be a local arborist or forester. Below is some basic information to assist you to identify your trees. Other more detailed descriptions can often be found online. Click on this link Identifying Trees in BC for a booklet that helps to identify 40 major trees from British Columbia. Many of these trees will also be throughout Canada and the USA. The term “conifer,” which describes most of the evergreen trees, includes several species that can be distinguished by a variety of their characteristics, including needles, cones and bark. 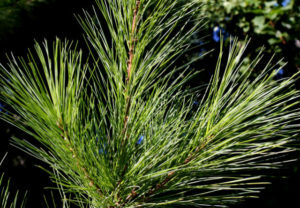 Determining if you have a pine, a fir or a spruce tree is critical. Your pest management plan is important, so we recommend that before starting any pest management strategies, you confirm your tree type with your local Forest Service or a forester in your area. Once you know the type of trees that you have, you can determine if you are likely to have pine beetle, fir beetle or spruce beetle attack. Beetles usually only attack specific tree species they are named for. On true pine trees, needles are arranged and attached to branches in clusters of two, three, or five needles per cluster. Spruce have their needles attached individually to branches. The needles are sharply pointed, square and easy to roll between your fingers. Spruce needles are attached to small, stalk-like woody projections on a branch and when needles are shed, these projections remain. As a result, the branches of spruce trees feel rough. The overall shape often resembles a traditional Christmas tree. Fir trees have their needles attached individually to branches. 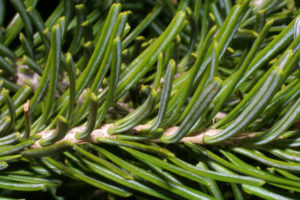 Fir needles are softer than Spruce, are flat and cannot be rolled between your fingers. Fir branches lack the small, stalk-like woody projections of Spruce trees and have smooth bark. The overall shape often resembles a traditional Christmas tree. Ash trees under attack by Emerald Ash Borer is becoming wide spread in Canada and the US. If you suspect you have this pest, we suggest you contact your local municipality to see what program they have in place to deal with the infestation. If you are an organization monitoring for EAB, please click here. It has compound leaves with 5-11 leaflets (depending on the species of ash). Leaflets may be finely toothed or have smooth edges. Leaflets may be on a short stalk or without a stock. White and green ashes have thick, diamond-patterned bark, while black ash bark is thin, ashy-gray, and scaly. There are over 100 species of Maple trees in North America, Europe and Asia. Maple is one of the preferred hosts for Asian Longhorn Beetle. If you suspect you have this pest, we suggest you contact your local municipality to see what program they have in place to deal with the infestation. If you are an organization monitoring for ALB, please click here. Leaves and twigs come in pairs that are opposite each other on the branch. Usually they have simple leaves (i.e. not divided into leaflets) with veins radiating from a single point at the leaf base (palmate veins) and long stems (petioles). How can I protect my conifers? Saving conifer trees naturally with semiochemical-based products is our business. Along with knowledgeable staff, state of the art production equipment, and the most up to date research, we can offer you the best product for the best price. Should I try to trap or repel beetles from my conifer trees? It’s important to understand the distinction between attracting beetles to your trees with a trap and lure vs. repelling beetles from your trees using semiochemicals. Trapping is done when monitoring to see if a particular type of beetle is present in an area. Trapping is also done when wanting to concentrate a beetle attack to a certain targeted zone of trees or slash piles which will then be harvested, removed or burned. Semiochemical lures used in traps are often very powerful and will usually overpower any repellents. The result is that many beetles will be attracted to targeted trees and increase the infestation in the area. Traps will have a spillover effect. The beetles will be attracted to the trap but anything within a 50 yard radius can also get attacked because of the semiochemical plume that is released from the trap lure. Trapping can reduce a beetle population to help in the following years. 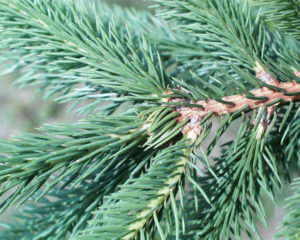 What are the signs of infestation on conifers? It can be very difficult to determine the number of bark beetle hits and whether or not the hits were successful. Sometimes blind attacks occur and these are almost impossible to find if the timing of observation isn’t perfect. It is best to assess your trees in the summer immediately after the flight. Generally it is thought that more than 40 successful attacks per square yard will be fatal to the tree, with less hits needed for older or mature trees. Some of the tell tale signs of beetle infestation are listed here. If you are concerned about your trees, it may be best to ask you local forester or arborist for their assessment. Look for small holes on the lower parts of the tree trunk. The holes often occur in regular patterns and may contain pitch or boring dust. Trees have a natural defense mechanism in order counter beetle attacks. 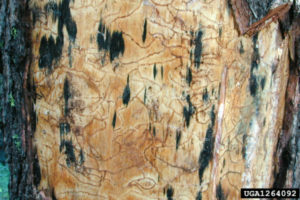 They produce a sticky resin to “pitch out” beetles as they bore into the bark. 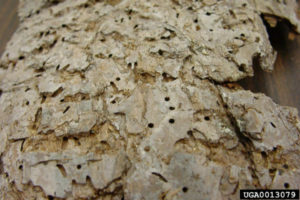 The first signs of beetle attack are small holes in the bark. Whitish or yellowish globs that look like dried, crusty honey or popcorn scattered over the bole of the tree are called pitch tubes. Large pitch tubes often indicate unsuccessful attacks while very small pitch tubes or no pitch tubes at all may indicate successful attacks by beetles. Stress, drought, or age can affect the trees ability to produce sufficient pitch to prevent tree mortality. Boring dust or Frass looks like mounds of sawdust at the base of the tree and in the bark crevice. The dust is generated when the beetles bore into the bark of the tree. Bark beetles prefer to bore into a tree where the bark is the thinnest, namely in the cracks and crevasses. 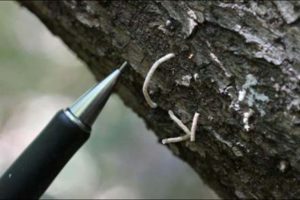 Frass has the consistency of flour or fine sawdust and falls on branches below the shotholes or forms a long cylinder as tree borer insects excavate tunnels. Bark beetles feed on the cambium layer and typically the frass will be dark brown or reddish in color. Ambrosia beetles bore into the heartwood of trees so the frass is typically white and can resemble toothpicks. 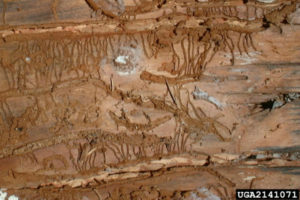 Removing a section of the bark on a tree may reveal tunnels and elaborate galleries created by the beetles as they bore through a tree. Tunnels indicate a successful attack. At times these tunnels will also contain grubs. We do not recommend you remove bark as this will injure the tree, releasing an attractive scent to beetles and leaving the tree more susceptible to attack. Woodpeckers find beetle larvae particularly delectable. 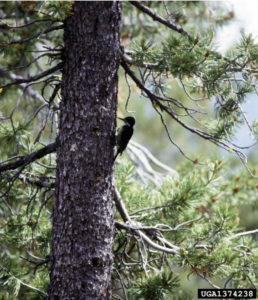 An abundance of woodpeckers can be a good indication of tree infestation. A beautiful green tree may already be infested, or worse, dead. The tree can remain green for 12 months or longer after a fatal beetle attack. By the summer and fall of the year following an attack, the tree will start to turn yellow then red because the green chlorophyll in the needles is gone. By this time, the beetles will have reproduced and the young left the tree. The red tree will finally change to gray when the needles begin to shed. This process can take up to 3-4 years. Beetles bring with them a symbiotic fungus called Blue Stain. A tree with blue stain fungus is a clear sign of beetle attack; but unfortunately this fungus is only visible when the tree is cut. It is important to note that when the first few beetles successfully attack a tree, they will emit a pheromone that will attract more beetles into the area. Also, for every pair of beetles that mate inside your tree, up to 60 will emerge next year. Even lightly attacked trees may succumb to further beetle attack the following year as these trees are highly attractive to beetles. This makes prevention the most important part of any beetle management strategy. Early prevention and suppression efforts are the methods mostly likely to succeed in the long run by keeping beetle numbers from growing exponentially. How can I prevent bark beetle attacks? If you reside in an area with beetle activity, we recommend you plan your beetle management strategy by consulting with a Forest Service representative, Forester or Certified Arborist in your region. Beetle activity can last for 3-5 years so a long-term strategy is best. If you need help locating a professional, we would be happy to assist you. Remember the adage: An ounce of prevention is worth a pound of cure. 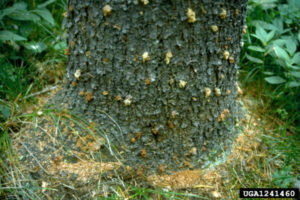 Infested trees should be removed well in advance of the anticipated beetle flight, ideally in the fall. The tree logs should be debarked, burned or buried in the ground. If you want to store the infested wood for later use, please read these government forestry articles below for best storage practices. Any remaining infested trees will have adult beetles ready to emerge the next spring with many more emerging than went in. Emerging beetles will all be looking close by for new host trees to begin the reproductive cycle again. If you are unable to remove infested felled trees, slash piles, etc, consider using a suitable repellent such as MCH / Verbenone in these areas to keep the beetle population low. The scent of freshly cut wood is the primary attractant that draws beetles directly to your trees during the spring and summer months. To avoid this, please do not prune or damage bark. Keeping your trees healthy is one of the best beetle defenses. Water and/or fertilize your stand if possible. Healthy trees have more “pitch”, the sticky resinous sap that drips from a wounded tree. This resin immobilizes the attacking beetle and ‘pitches’ it out. To ensure your tree has a good supply of pitch, keep it well watered, especially in times of drought. Thinning your tree stand to 15-20 feet (4-6 meters) between trees can help support the healthiest ones to remain beetle free. Overcrowding of young saplings can rob mature trees of water, sunlight and nutrients. Thinning is determined by the geography of the land and number of trees and species types. Contact your local Forest Service office or Forester for more guidance. A variety of trees in your stand can help keep your trees healthier. A mix of tree species will reduce the risk of attack from any given insect pest. Each tree species usually has different sun, water and nutrient requirements. Remember, the roll of the beetle is to speed up the normal decay of older, stressed trees in order to keep the natural ecosystem at its healthiest. Synergy Shield™ MCH products reduce tree mortality on your property by repelling Douglas Fir Beetle and Spruce Beetle. Synergy Shield™ Verbenone (USA customers only) products reduce tree mortality on your property by repelling Mountain pine beetle (Dendroctonus ponderosae), Southern pine beetle (Dendroctonus frontalis), Western pine beetle (Dendroctonus brevicomis) and other bark beetles. All Synergy Shield™ products are safe and easy to use, and do not harm birds, mammals pets, or other predator insects. Put out your Synergy Shield™ before the first beetles take flight in the spring because once the first pioneer beetles land on a tree, they will send out a very attractive pheromone to invite other beetles into that direction. Synergy Shield™ MCH and Verbenone will stop the attraction of beetles to your trees.